Say you and your friends were facing an evil, ultra-powerful entity from another dimension. It’s not looking good. She’s managed to destroy a huge chunk of New York City already, and your ghost-busting equipment isn’t doing anything to contain her. Without warning, she disappears, warning that a “destroyer” will follow. She says you’re the ones who have to choose its form. You try, but you can’t. It’s impossible not to think of something. So you decide to think of the cutest, cuddliest, least-threatening thing in the world. What is it? Bunnies? Puppies? Babies? The Stay Puft Mashmallow Man? 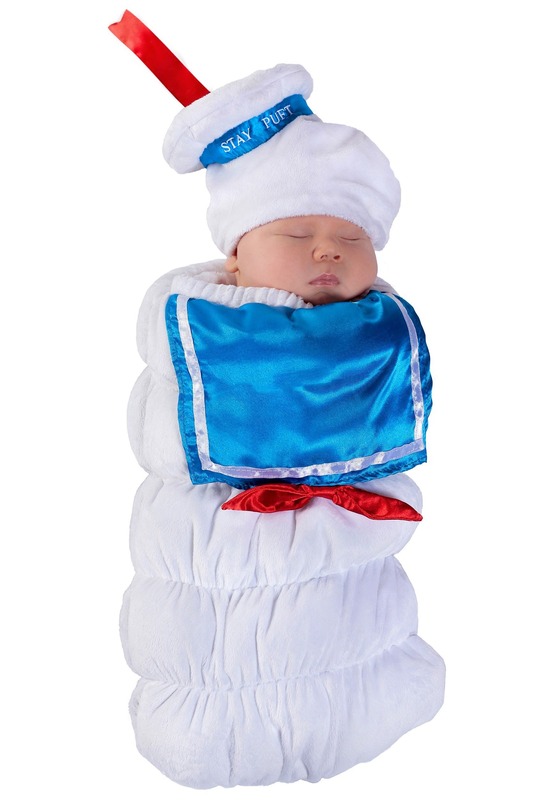 Suddenly, it comes to you… a baby Stay Puft Marshmallow Man! “The destroyer has been chosen,” your enemy intones, and you see a shadow on the horizon. It’s a giant baby Stay Puft Marshmallow Man, and it’s the cutest thing you’ve ever seen. It crawls through the city streets, its little cap slid jauntily to one side and its red necktie swinging. Its face it lit with a huge, joyful grin. You’re so relieved you made the right choice. Something this adorable could never wreak havoc, right? …And then it starts pulling down buildings. And you realize you’ve made a terrible mistake. It may have been a mistake to picture such an adorable destroyer of worlds, but it’s definitely the right choice to dress your own little bundle of joy in this Infant Stay Puft Bunting costume. The plush one-piece bunting has an attached blue bib and red bow, and it comes with a little white hat that says “Stay Puft” on its blue ribbon. As soon as you wrap your baby up inside, it will be the cutest little ghost ever to get busted!